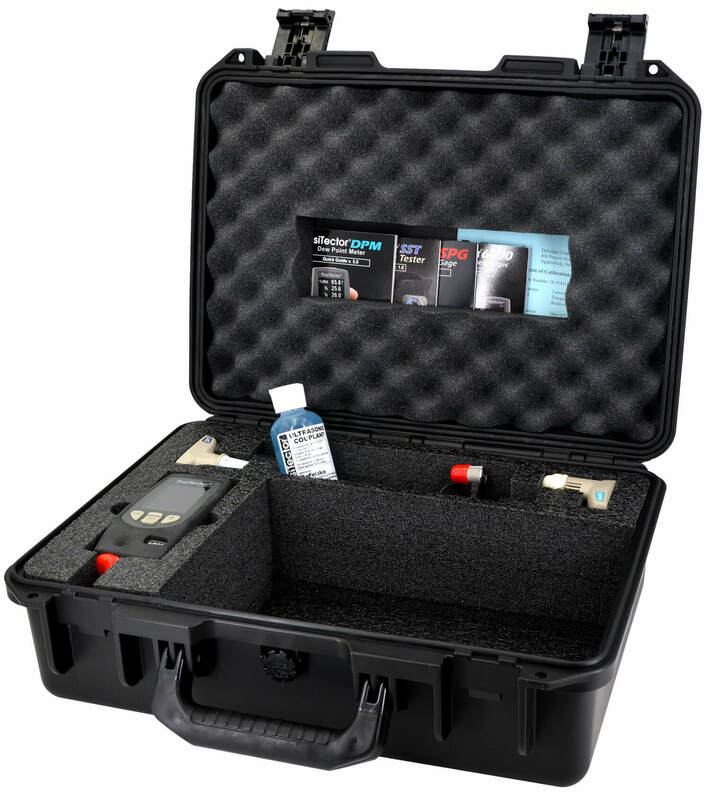 Heavy-duty, waterproof Large Pelican* cases come complete with a custom foam insert to securely hold your PosiTector instruments and 5+ PosiTector probes - including the PosiTector SST Soluble Salt Tester accessories. 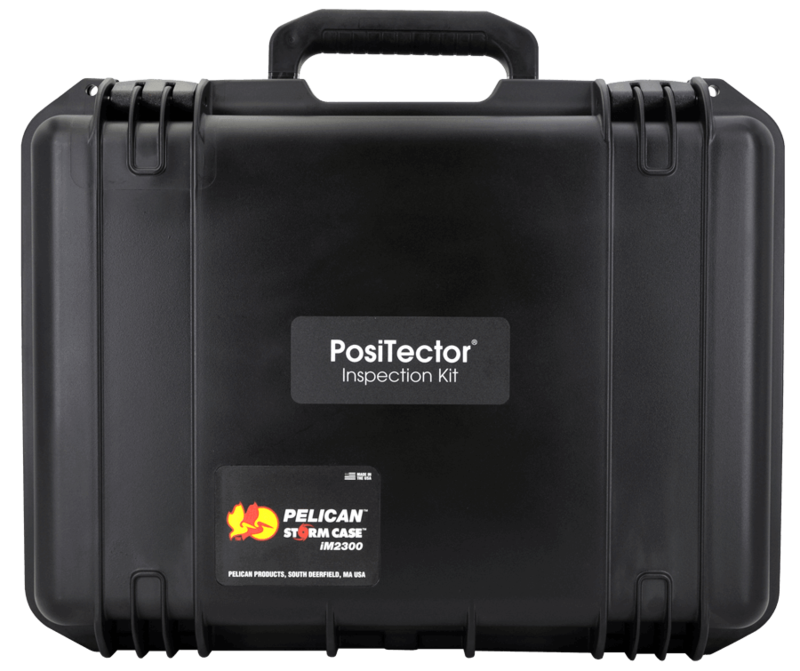 Heavy-duty, waterproof Pelican* cases come complete with a custom foam insert to securely hold your PosiTector instruments and 3+ PosiTector probes. Stated accuracy of Td is ±3C for Td from -40 to 80C. The following charts illustrate the maximum error of Td with respect to Ta and RH. 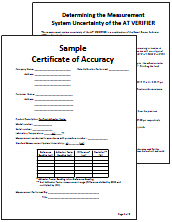 View PDF of Accuracy Statement here. 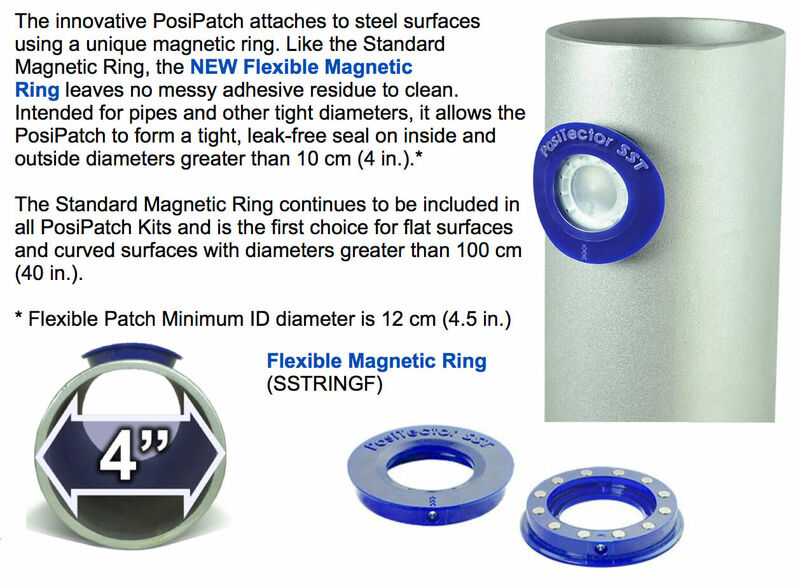 The innovative PosiPatch uses a magnetic ring to hold it against the surface, so no adhesive is required. This means that the PosiPatch isn’t destroyed when removed from the surface, unlike conventional patches. After rinsing with deionized water, the PosiPatch can be used again. The PosiPatch can be reused multiple times until water begins to leak through the air-permeable membrane or the seal against the substrate. In our tests on freshly blasted steel with a typical 50-100 micron (2-4 mil) profile, PosiPatches were reused dozens of times with no noticeable wear or leakage. Patch life will vary depending on use- if dragged along the substrate, lifespan will be reduced. We believe that 10 uses is a very conservative estimate of lifespan and still yields the lowest per-test cost of any commercially available Bresle Method Patch. The below tables compare the per-test costs of various options, using competitive prices found online. What are zero plates used for? Coated metal Standards for magnetic and eddy current gages usually include a zero plate. The first gage measurement is on the zero plate to verify that the gage measures zero correctly. If not, electronic gages can usually be adjusted to “0” on the zero plate. Alternatively, some specifications allow the measured difference from zero to be subtracted from future coating measurements. 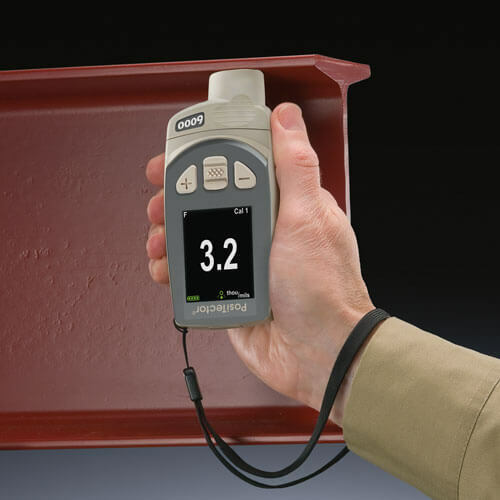 A zero plate is also a convenient base onto which a certified or non-certified plastic shim can be placed for measurement. 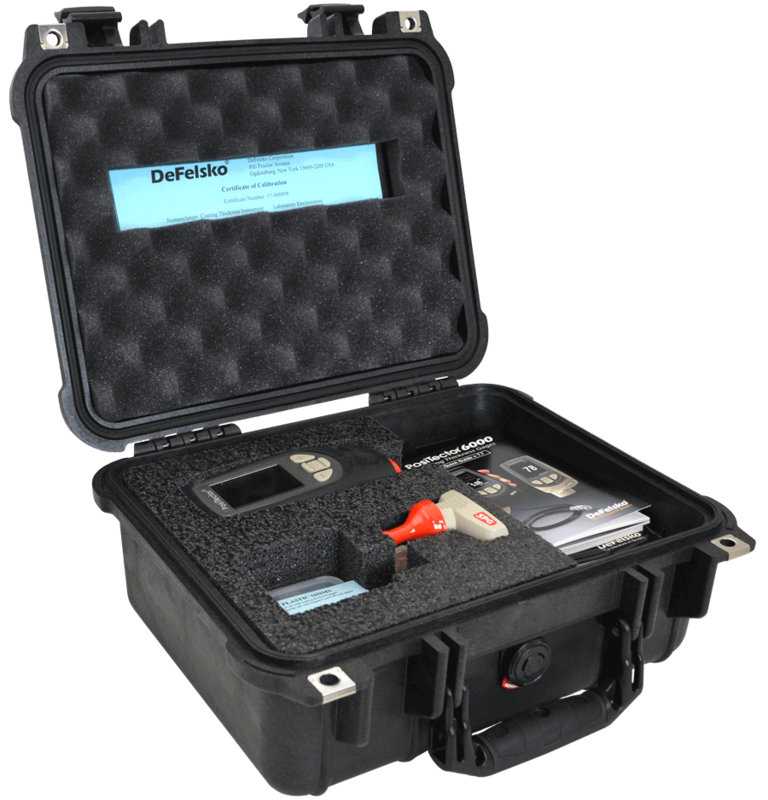 For best accuracy it is important to ensure a coating thickness gage meaures "0" on the uncoated substrate and adjusted to "0" if necessary. This is especially true when the substrate is rough, shaped, extremely thin, or is an alloy. When an uncoated piece of the material is not available for a zero check, some procedures call for the gage to be adjusted to "0" on an uncoated zero plate. 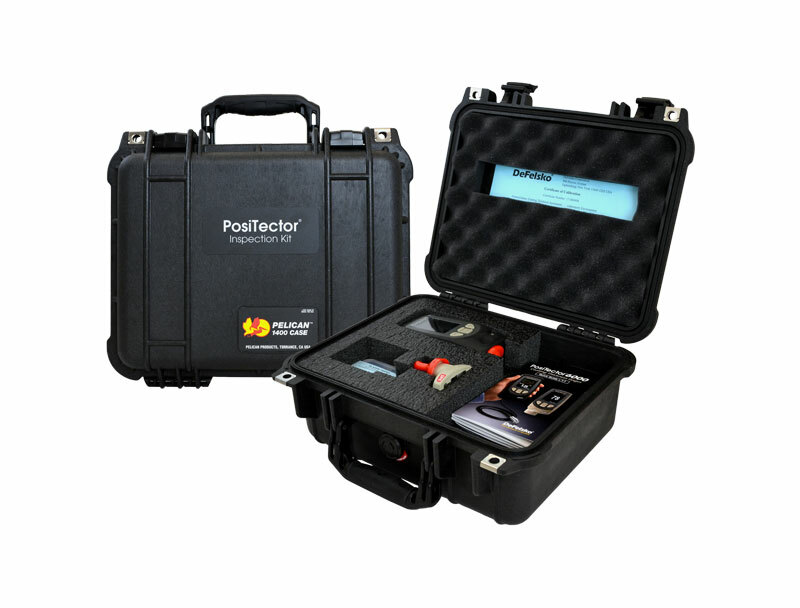 A compensation value is then subtracted from future coating measurements. Zero plates are also used to provide a substrate where none exists. 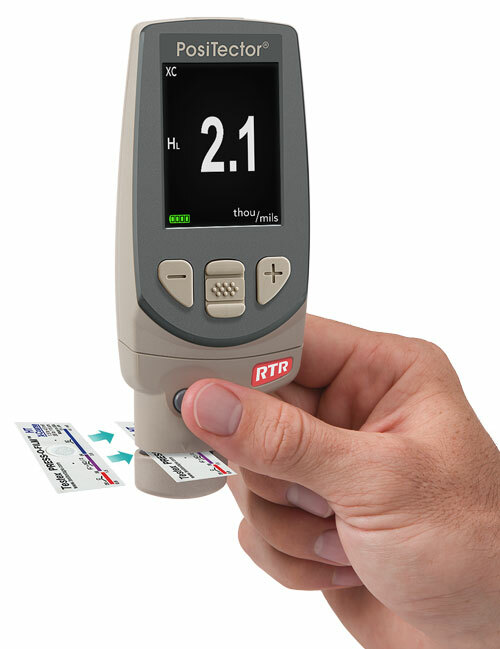 Large sheets of material such as paper, plastic, fabric and rubber can be measured with a coating thickness gage by placing the material over the zero plate. This is useful when the measured item is too large to access with a micrometer or other device. The screen printing industry uses zero plates to measure the thickness of the "substrate" being printed. 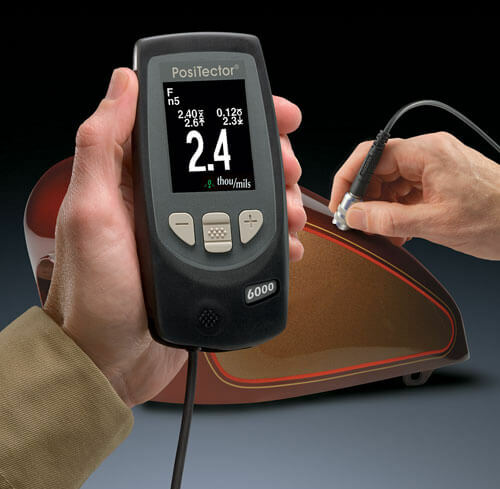 For best accuracy it is important to ensure a coating thickness gage measures "0" on the uncoated substrate and adjusted to "0" if necessary. This is especially true when the substrate is rough, shaped, extremely thin, or is an alloy. When an uncoated piece of the material is not available for a zero check, some procedures call for the gage to be adjusted to "0" on an uncoated zero plate. 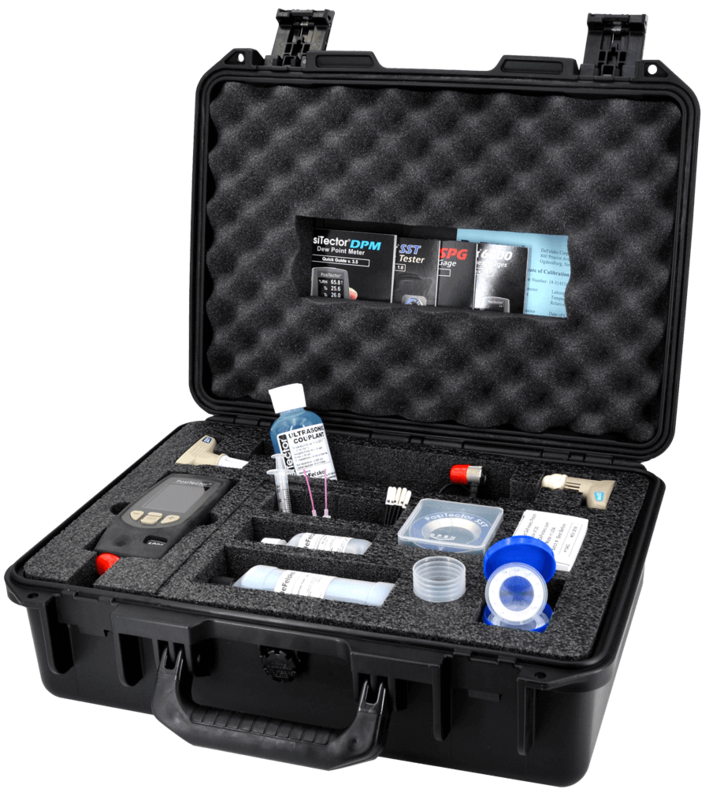 A compensation value is then subtracted from future coating measurements. 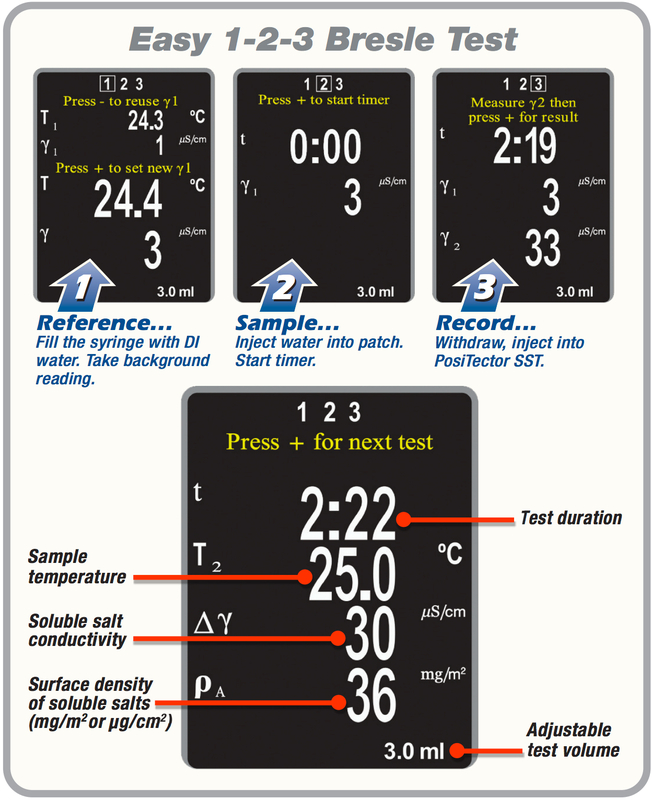 Replica Tape provides a simple way to obtain an impression of a surface for analysis. It consists of a layer of crushable plastic micro foam affixed to a 50.8 μm (2 mil) incompressible polyester film. When compressed against a roughened surface, the foam collapses and acquires an impression, or reverse replica, of the surface. 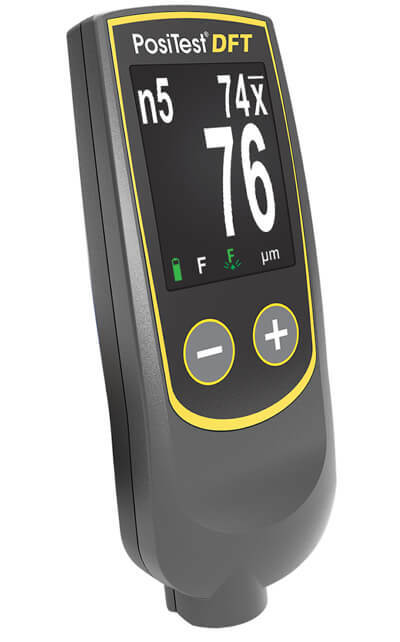 It is available in a number of grades to accommodate measurements in different profile ranges. 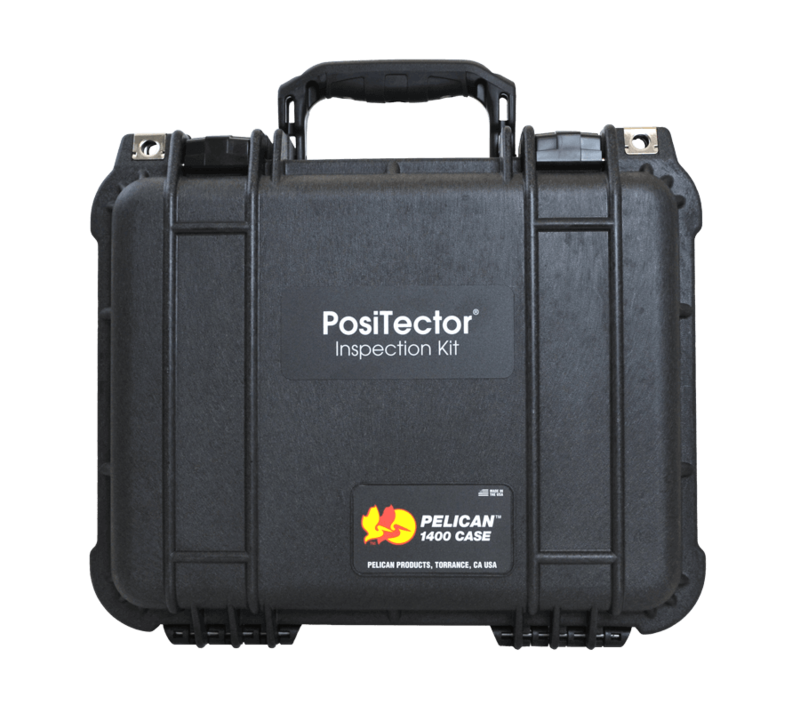 Placing the compressed tape (replica) into the PosiTector RTR gives a measure of the average maximum peak-to-valley height of the surface roughness profile. 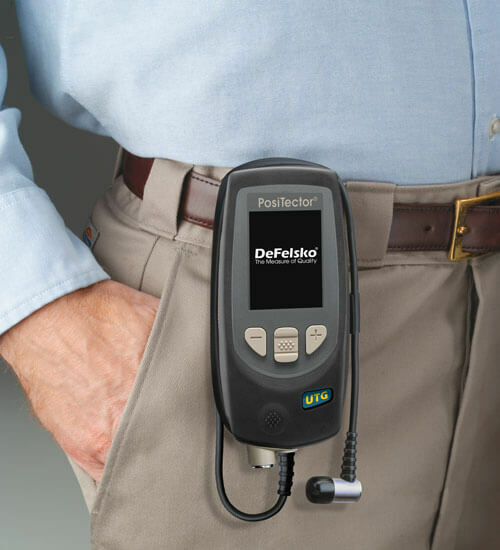 ‍The gage automatically subtracts the thickness of the polyester substrate from all measurements. 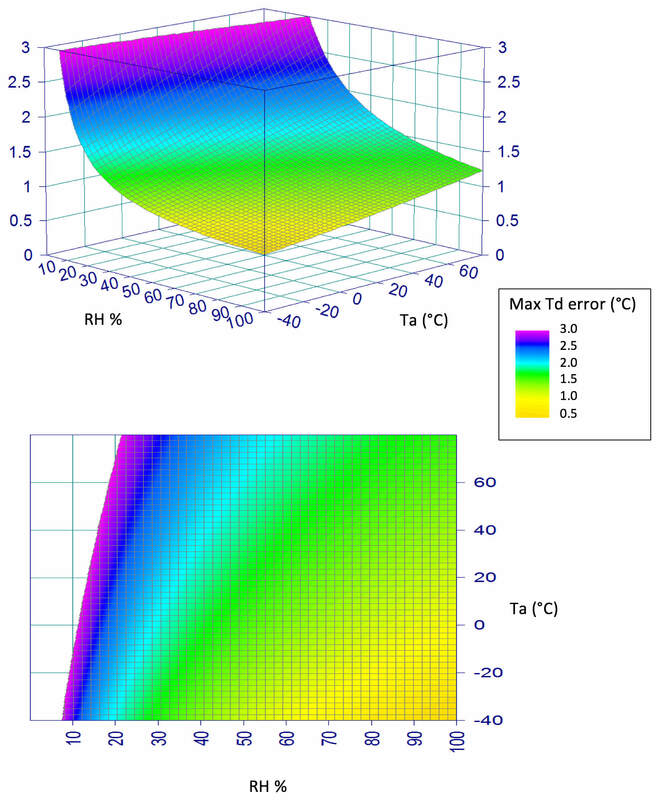 *Range may change depending on surface roughness, temperature or material properties. 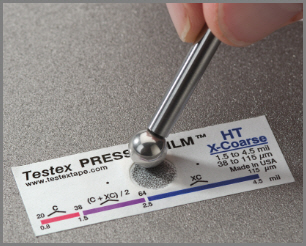 Two grades of Testex™ Press-O-Film™ replica tape, “Coarse” and "X-Coarse", are available to span the primary range of surface profiles for the coatings and linings industry –– 20 to 115 µm / 0.8 to 4.5 mils. An unfortunate characteristic of replica tape is that conventional spring micrometer measurements are most accurate near the middle of each grade's range and least accurate at the outer ends of each grade's range. 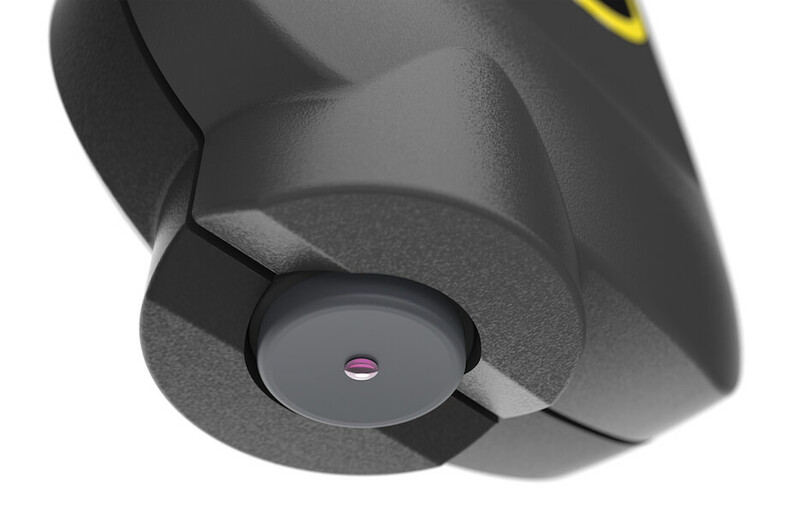 That is why two other grades, Coarse Minus (< 20 µm / 0.8 mils) and X-Coarse Plus (> 115 µm / 4.5 mils), are used to check and, if necessary, adjust measurements at the upper and lower ends of the primary range. Inside the primary range, Coarse and X-Coarse tape share a 38 - 64 μm (1.5 - 2.5 mils) "overlap" region. 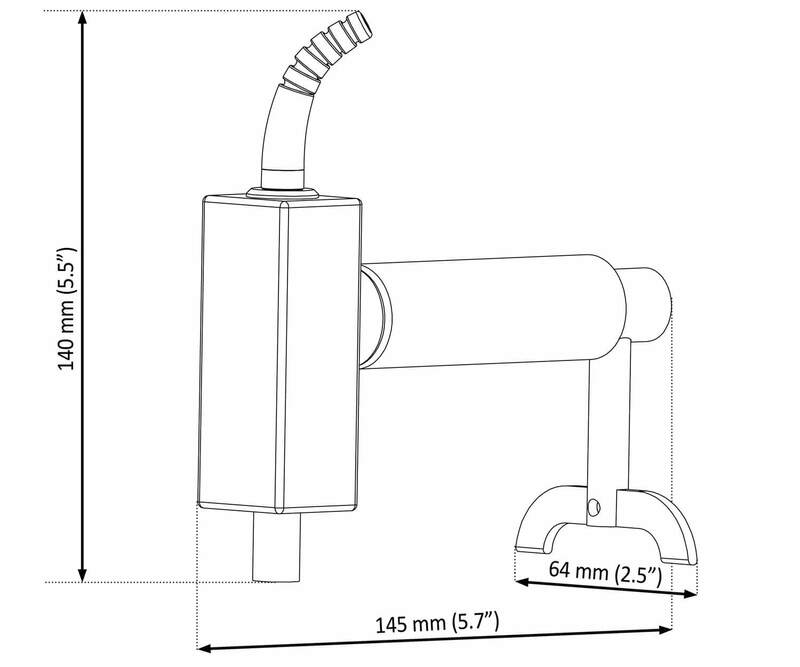 Measurements with conventional micrometers require a complicated and time consuming procedure of averaging one reading using Coarse grade and one reading using X-Coarse grade to achieve reasonable accuracy. 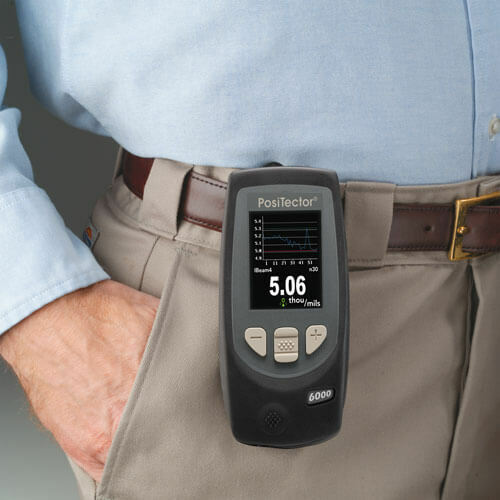 With a single measurement, the PosiTector RTR produces a more accurate peak-to-valley height measurement HL from Coarse or X-Coarse tapes that has been adjusted for their non-linearity. There is no need to average two or more replicas from different grades of tape AND there is no need to subtract the 50.8 μm / 2 mils of incompressible polyester film. 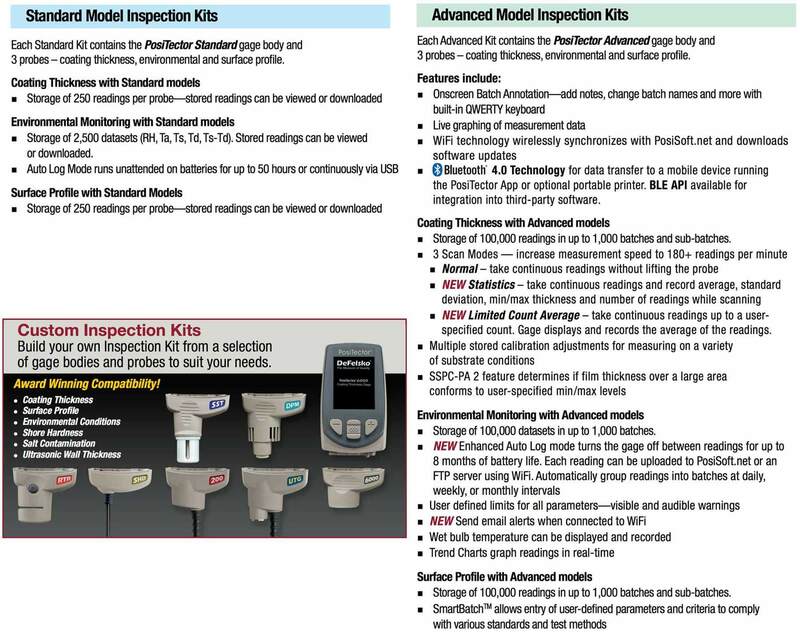 The advantages are a reduction in measurement uncertainty, inspector workload, likelihood of error, and the number of replicas needed by inspectors to assure accuracy. 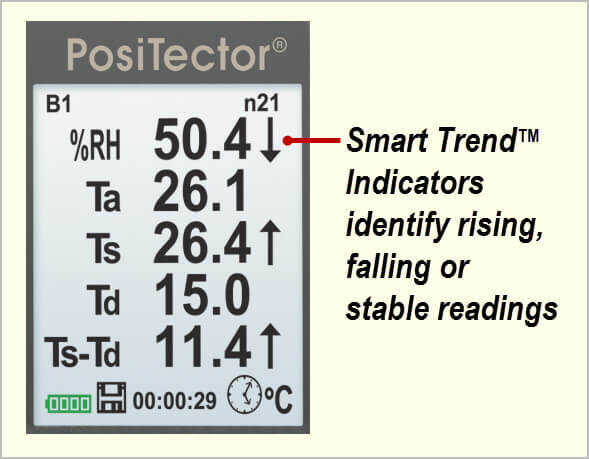 The PosiTector RTR can also display a height value (H) that is comparable to what conventional analog spring micrometers would display after the 50.8 μm / 2 mils of incompressible polyester film has been subtracted. 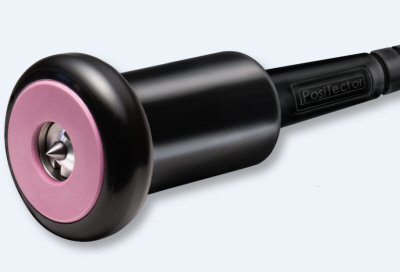 ‍All PosiTector SPG probes feature a Alumina wear face and tungsten carbide tip for long life and continuous accuracy - field replaceable. ‍Fig. 1. Pencil-type magnetic pull-off thickness gauge. Magnetic film gages are used to non-destructively measure the thickness of a nonmagnetic coating on ferrous substrates. 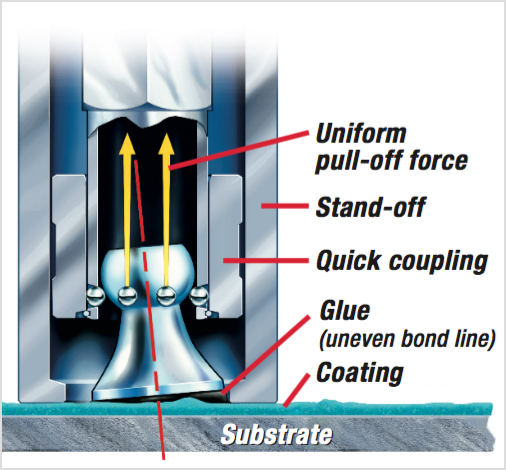 Most coatings on steel and iron are measured this way. 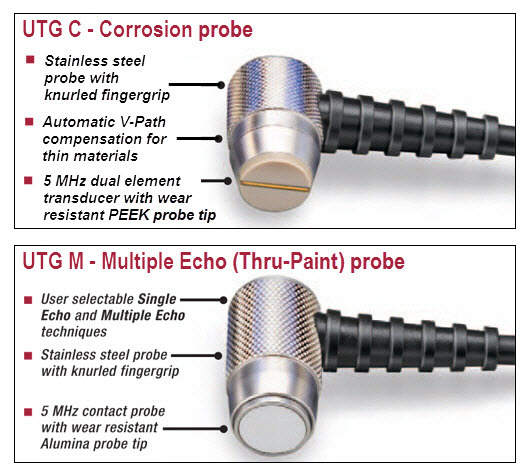 Magnetic gages use one of two principles of operation: magnetic pull-off or magnetic/electromagnetic induction. Flip display enables right-side-up viewing. 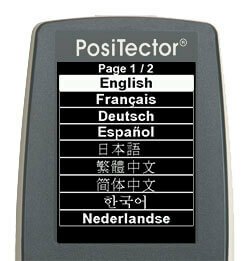 PosiTector users can capture and save an image copy of the current gage display by simultaneously pressing both the (-) and (+) buttons. 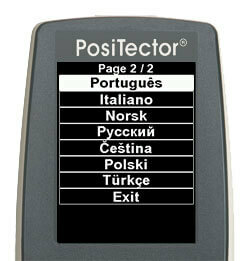 The last 10 screen captures are stored in memory and can be accessed within the PosiSoft USB Drive. 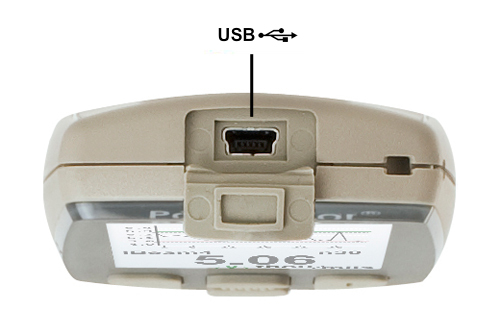 ‍‍USB port for fast, simple connection to a PC and to supply continuous power. USB cable included. 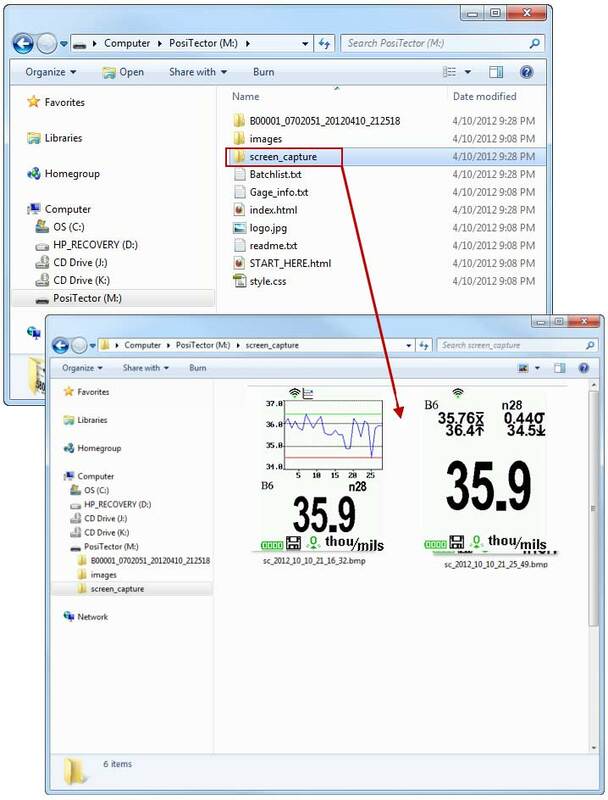 ‍Statistics mode continually displays/updates average, standard deviation, min/max thickness and number of readings while measuring. Display Languages: English, French, German, Spanish, Chinese, Japanese, Portuguese, Italian, Norwegian, Russian, Czech, Polish and Korean. 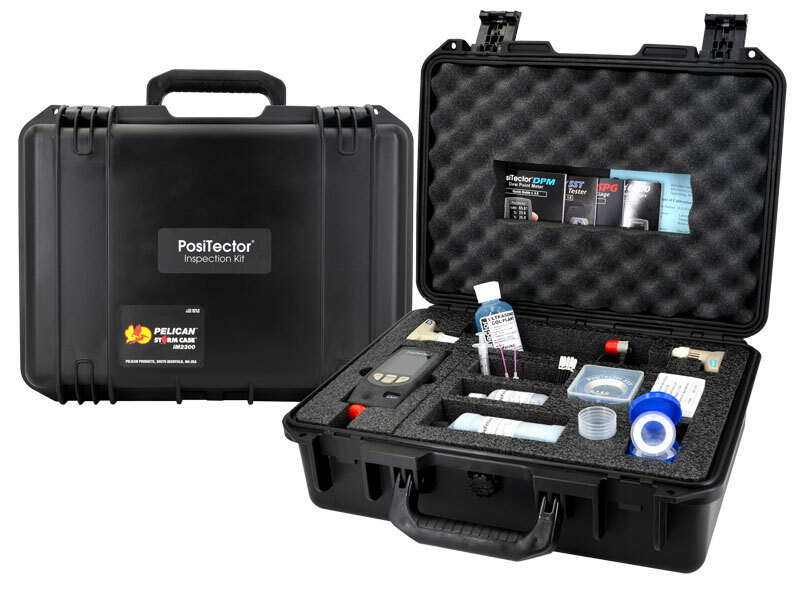 All PosiTector 6000 regular separate probes are suitable for underwater measurement and are available with extended cable lengths up to 250 feet / 75 meters. 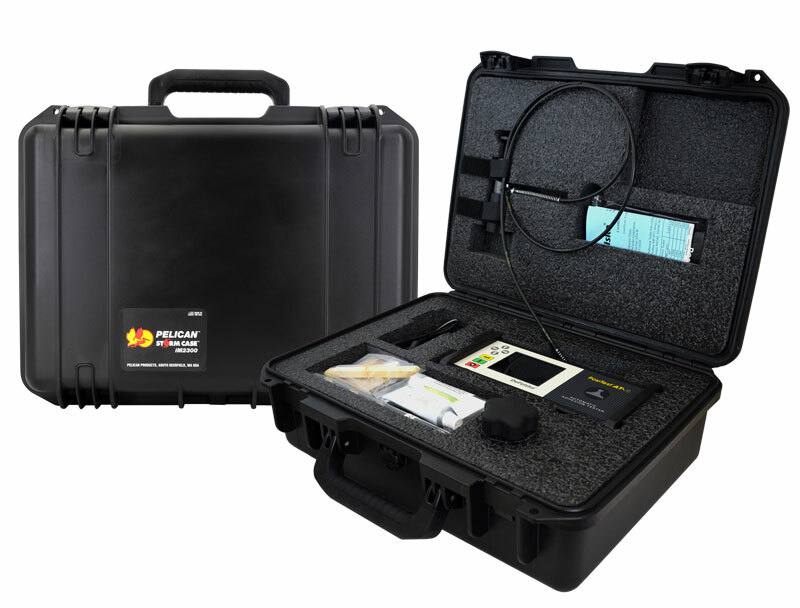 Ideal for measuring coating thickness on underwater pipes, ships, bulkheads, offshore oil rigs or anywhere extended reach is required. Extended cable lengths are also available for ferrous micro probes (F0S, F45S, F90S) and FKS probes (thick coatings) – up to 50 ft (15 m). Contact us for additional information including lead time.